The days are continuing to get longer and the weather has been practically the picture of perfection. With warmer air and electric sunshine rays, the snow is quickly melting and we just can’t seem to get enough! With over two months of the spring season remaining, it’s the perfect time of year to break out of hibernation and hop on these 10 awesome trails. Remember to be aware of wildlife that surrounds area trails all throughout The Kenai, Alaska’s Playground. As one of the most popular hikes on the Kenai Peninsula, this well-maintained trail makes it easy to get into to the serene surroundings of nature without having to go too far. The remarkable views of Exit Glacier in Kenai Fjords National Park will take your breath away. Take the 2-mile loop from the Nature Center or keep on going and make it a 3 or 4 mile trek. If you’re after a longer journey, continue on up to the Harding Icefield. For more trail information, click HERE. This 1.2-mile loop trail offers scenic views overlooking Kachemak Bay, with tremendous wildlife viewing opportunities to boot. Walk the shores of Bishop’s Beach while beach combing along the way. For more trail information, click HERE. Nothing beats a long walk on the beach, especially when you have the whole place all to yourself. That’s the feeling you get out here. Enjoy the picnic area (with a million dollar view) and then take a nice flat walk on the beach with the whole family. For more trail information, click HERE. This scenic 3 mile trail will lead you from the beautiful Lowell Point beach area through lush hemlock and spruce trees on to Tonsina Creek. Stop and take time to soak in the views overlooking Resurrection Bay as you enjoy gradual elevation gain. For more trail information, click HERE. Access this short, sweet hike by taking Skilak Lake Loop to mile marker 6.9 (accessible from the Sterling or Cooper Landing) in the Kenai National Wildlife Refuge. You’ll climb a fairly steep .8 miles up hill, but the view you’ll be rewarded with is way worth any pain from the elevation gain. Soak in sights overlooking Skilak Lake and the robust Kenai Mountains. For more trail information, click HERE. Hike along the Keen-Eye Nature Trail with interpretive information along a well-maintained path. Visitors can take a side path down to Headquarters Lake in the Kenai National Wildlife Refuge. Continue on to the 2-mile Centennial Trail Loop to enjoy a beautiful nature escape with plentiful wildlife viewing opportunities. For more trail information, click HERE. This 3-mile out and back hike is located off of Skilak Lake Loop and it is a fairly flat, winding hike. You’ll go through a variety of diverse terrain, with excellent berry picking opportunities during July and August. You’ll also wind through an old burn area from the 1996 wildfire, giving you widespread views overlooking the surrounding Kenai Mountains. For more trail information, click HERE. Located near to town in Homer just down East End Road, this lovely little nature trail winds through thick spruce forest with enchanting widespread meadows. The observation platform overlooking the Beluga wetlands provides tremendous birding and wildlife viewing opportunities. For more trail information, click HERE. Head to the Russian River Campground to access the trailhead for this awesome hike. The whole family will love the wide gravel path with gentle elevation gain. During the summer months, this is a great place to view salmon running in the streams beneath the falls. This area is also known for its frequent bear encounters, so remember to be cautious. For more trail information, click HERE. Bring a fly rod and walk the Anchor River while fishing, or head down to the soft sandy beach to walk for a few flat miles. Soak in breathtaking scenery overlooking Kachemak Bay leading to spectacular views of mountains and volcanoes in the distance. For more trail information, click HERE. Other nearby hiking areas include Stariski Creek and Whiskey Gulch. If you love beach walks, check out a full list of some of the Kenai Peninsula’s most beautiful sandy shores by clicking HERE. 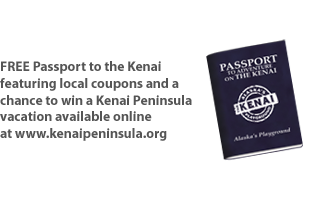 Also, we highly recommend the book 50 Hikes In Alaska’s Kenai Peninsula, which is available for purchase by clicking HERE. If you have any questions about any of these beautiful hikes, feel free to let us know in the comments below or by visiting our Facebook page. Have fun out there, adventure hounds!